Bradbury Place is situated on the prestigious west side of the historic market town of Chesterfield in Derbyshire. The new development is on the site of the former Bradbury Hall and consists of four apartment blocks and a Mediterranean restaurant to replace the tyre centre. There are several small boutiques positioned adjacent to the site. The restaurant is scheduled to open in early 2009. Bradbury Place is virtually 5 minutes drive into the town centre and within easy walking distance. It is in close proximity of fashionable shops, restaurants and both traditional and modern pubs. The apartments will also have the benefit of views over the surrounding countryside. Chesterfield houses one of the largest open air markets in the country with up to 250 stalls. The market takes place every Monday, Friday and Saturday with a flea market on a Thursday. The most famous attraction of Chesterfield is the amazing Crooked Spire of the St.Mary’s and All Saints Church. The Spire reaches 228 feet and is a well known highly visible landmark. Chesterfield has managed to retain some of its medieval streets and buildings which attract visitors far and wide. There are narrow streets off the Market Place leading to the Shambles and the Butchery quarter. The newest addition to the town is the Vicar Lane Shopping Centre which was opened in 2000. To the south of the town centre is Queen’s Park which was built to celebrate Queen Victoria’s Golden Jubilee. It has a cricket ground and boating lake and also houses the towns largest leisure centre. The town has many leisure attractions including several golf courses, fitness centres, all-weather tennis club, cinema complex, go-Karting to mention a few. It is also home to the Chesterfield Football Club, better known as the Spireites. There are plenty of restaurants to choose from in the town centre which cater for all tastes. There is also a thriving night life in Chesterfield which has some excellent wine bars, traditional pubs and trendy night clubs. If you prefer a more cultured evening at the theatre, Chesterfield has the Pomegranate theatre; a grade 2 listed Victorian arch theatre which hosts both professional touring and amateur productions. The town is a central location for excellent communications either by road, rail or coach. The M1 is approximately 10 miles away which makes commuting to Nottingham and Derby very easy. Sheffield is 11 miles north of Chesterfield and easily accessible via the A61. There is also a direct rail link to London St Pancras from Chesterfield station, which leaves on a regular basis throughout the day. Chesterfield coach station is situated on New Beetwell Street which has both local and national services. Airport accessibility is good with East Midlands Airport approximately 40 minutes away and Manchester airport about 1hr 30 minutes away. There are also domestic flights more locally from Sheffield and Doncaster. 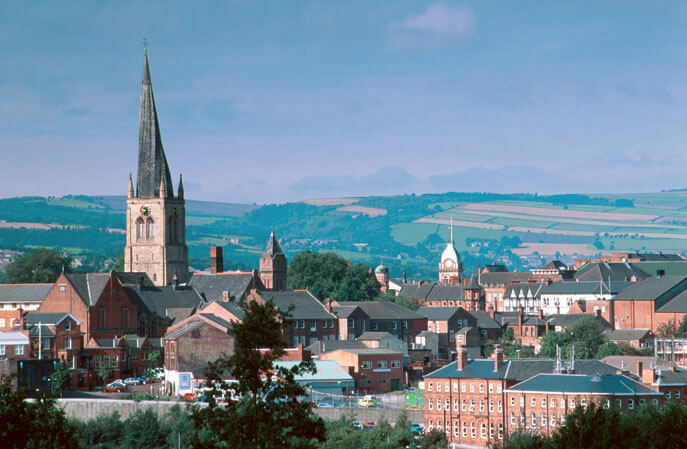 Another very famous attraction to Chesterfield is its close proximity to the Peak District National Park. It is renowned for its outstanding beauty and largely unspoilt scenery. Just a few miles away from Bradbury Place is the magnificent Chatsworth estate, home to the Duke and Duchess of Devonshire. The house attracts visitors from all over the world to see its fine works of art, its breathtaking surroundings and its excellent farm shop. There are also a number of attractions throughout the year such as Chatsworth country fair and various open air concerts. It is also a regular bolthole for members of the Royal family. There are also many surrounding villages which have historical backgrounds. Bakewell, which is famous for its tart and Monday market, is a very popular venue. The annual Bakewell show brings audiences nationwide. Bakewell is also home to Haddon Hall, a fortified medieval manor house dating back to the 12th century. The house is open to visitors from April to October. The local spa towns of Matlock Bath and Buxton are well worth a visit. Neighbouring town Bolsover houses a magnificent ancient castle and Clay Cross is home of the famous railway pioneer George Stephenson. As well as having a wealth of offerings, Chesterfield is also considered to be a good area for property investment. A recent survey undertaken by independent data analysts Prophit, have prepared house price forecasts over the next five years. Chesterfield has been depicted as a hot spot in the East Midlands area with an estimated growth of 22.8% over this period. Not only is Chesterfield considered an excellent place to live with its beautiful market town and country surroundings, it is also regarded as being a good investment proposition.